Well read on to find out exactly when, who and what the Swans did on 2nd November! 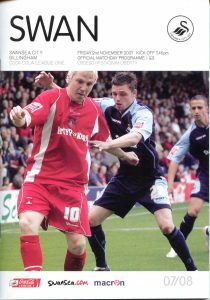 9 years ago in 2007 – The Swans drew 1-1 with Gillingham in Coca-Cola Football League One in an incident packed game at the Liberty Stadium. Roberto Martinez’s top of the table Swans did well to earn a share of the spoils, after playing with 10-men for the majority of the game, thanks to referee Stuart Attwell sending off of Warren Feeney after only 23 minutes. The 13,452 crowd went home relatively happy though thanks to a Paul Anderson equaliser in the 79th minute, although it could have been better had Andy Robinson not had his injury time penalty saved. 12 years ago in 2004 – The Swans lost 1-0 at Wycombe Wanderers in the LDV Vans Trophy 2nd Round – Southern Section. Kenny Jackett’s men produced a woeful display, failing to get a shot on target in front of the miserly 1,021 crowd at the Causeway Stadium. 14 years ago in 2002 – Languishing at the bottom of Nationwide Football League Division Three, the Swans lost one nil at 5th placed Cambridge United. In truth the margin of defeat could have been a lot greater had Dave Kitson and co found their goalscoring touch. 17 years ago in 1999 – A Richie Appleby goal was the only consolation for John Hollins, as his Swansea side went down to a 2-1 defeat at Northampton Town in Nationwide Football League Division Three. The defeat left the Swans in 16th place in the Division. 19 years ago in 1997 – Nick Cusack and Aidan Newhouse made their Swansea debuts, as a Keith ‘Sky’ Walker goal gave the Swans a win over bitter rivals Cardiff City at Ninian Park in Nationwide Football League Division Three. Scott Young’s sending off adding insult to injury for the Bluebirds and sparked violent scenes with seats being ripped up and thrown at rival fans. The game marked the first time away supporters had once again been allowed to attend matches between the clubs since 1993. The Swans win meant new manager Alan Cork maintained his unbeaten record since taking over from Micky Adams. 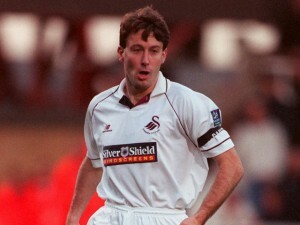 20 years ago in 1996 – Nationwide Football League Division Three Swansea beat Northampton Town one nil at the Vetch Field thanks to a second half goal from Steve Torpey. 23 years ago in 1993 – Fighting back from a goal down, the Swans eased to a 3-1 over Burnley at the Vetch Field thanks to goals from Martin Hayes, Colin Pascoe and Jason Bowen. The win in front of a 3,358 crowd saw the Frank Burrows team move up to 11th place in the Endsleigh Insurance League Divsion Two table. 31 years ago in 1985 – A crowd of 3,530 watched the 21st placed Swans beat mid-table Bury 1-0 at the Vetch Field in Canon League Division Three thanks to Alan Waddle’s second half strike. Manager John Bond handed a debut to striker Sean McCarthy. 40 years ago in 1976 – Despite Leighton James giving the Swans an early lead, they succumbed to a 5-1 defeat against Second Division Bolton Wanderers in this League Cup 4th Round replay at Burden Park, having held the Trotters to a creditable draw at the Vetch Field a week earlier. I was at Bolton in ’76. One bus load as I recall. Few of us lads hung around the Club Shop and jumped on the Supporters Club bus as there were spare seats. Recall going 1-0 up and a Bolton fan who we were standing near to (no segregation!) said ”no problem, we’ll get five” and he was right!!. Seem to remember Steve Potter in goal having a ‘mare’!…..40 years ago!?………unbelievable! !